The Jack and Jill Mats are ideal for any young child learning new skills or anyone interested in a softer tumbling mat. Our mats do not contain lead and have passed testing requirements enacted by the Consumer Protection Safety Improvement Act of 2008. When folded, this tumbling mat is 6” narrower than other mats, making it easier to perform skills over the mat. It’s also easier to carry! 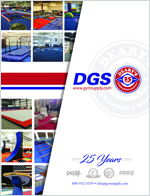 The combination of firm foam (top layer) and soft foam (bottom layer) provides a safe and forgiving area for skills like forward and backward rolls, bridges, cartwheels and much more! The non-skid material on the bottom of the mat will prevent it from sliding or moving. As with all Tumbl Trak™ mats, only the best quality materials are used in its construction. 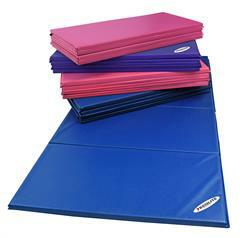 PARENT TIP: Although the name denotes preschool, many older kids also enjoy this softer, more forgiving tumbling mat.